In our cover story this month we discuss the measures corporations can—and should—take in order to prepare for the imminent interest rate rises.With an increasing range of risk management techniques available, CFOs have more options than ever to consider when managing their future borrowing costs.They are also receiving better information than ever about the likely timing and magnitude of interest rate changes.The world’s central bankers are taking great pains to let the markets know beforehand when they are planning to move on rates, giving all concerned plenty of time to make any necessary adjustments. That’s the theory, at least. 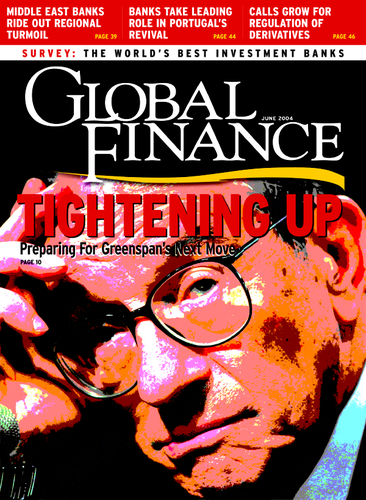 For many months now, for example, US Federal Reserve chairman Alan Greenspan has been hinting increasingly strongly that US rates are set to start rising gently. Word has been trickling out of the Chinese central bank that it might be raising rates soon for the first time in nine years. In Britain, a rash of whispers and hints has emerged recently from the Monetary Policy Committee that should leave no one in any doubt that it will be pushing for further rises in the near future. The intended result of this softly-softly approach is that by the time the interest rates finally do change, no one is shocked.The markets will have already priced in the changes, and businesses will have made all necessary adjustments with plenty of time to spare. Crucially, though, this scenario is dependent on the banks’ getting their timing just right—and on the markets having complete confidence in the judgment of the central bankers. That’s a rare combination. Judging by the gyrations in the world’s stock markets and currency exchange rates that followed the latest round of hints and whispers, the markets don’t have complete confidence in the central bankers after all. All this provides a stark reminder for corporations that it might not be wise to base their interest rate strategy solely on their predictions for future central bank base rate changes. And they might do well to remember that there is one more risk management tool that should be applied in such situations: It’s called common sense.